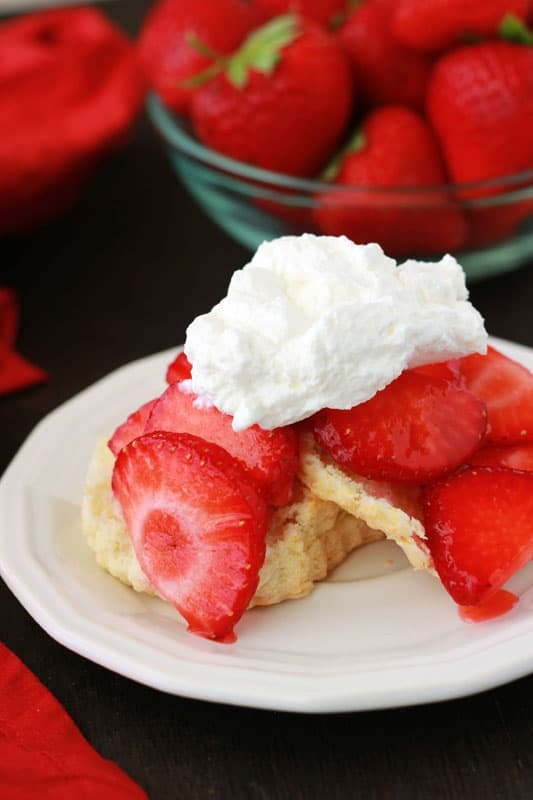 This Strawberry Shortcake is the perfect way to use some in season produce for a quick sweet treat! Strawberries are the fruit that always makes it’s way into my cart. The smell is what immediately pulls me in and the bright red color tells me “You know you want to… Just do it.” And of course, because I give in to all peer pressure, I end up going home with the fresh berries. Now here’s the problem… I almost NEVER eat them before they go bad. They sit in the back of the refrigerator lonely and ignored and eventually make their way to the garbage. Sad, right?! This time around we bought them with something specific in mind. My little guy saw an episode of Curious George where that monkey made some sort of cabbage juice (sounds appetizing, right?) and one of the secret ingredients was strawberries. After attempting to make our own version (which was quickly dumped down the drain) we had some leftover berries begging to be used. That is when I remembered I had THIS recipe on my site. I did a quick search and saw outdated photos ready to be retaken. I was so surprised at the ease of the little cakes. For some reason I thought they were going to be more complicated but I had them whipped up and in the oven in under five minutes. The topping was just as simple and the end result is a slightly sweet treat ready to be devoured. 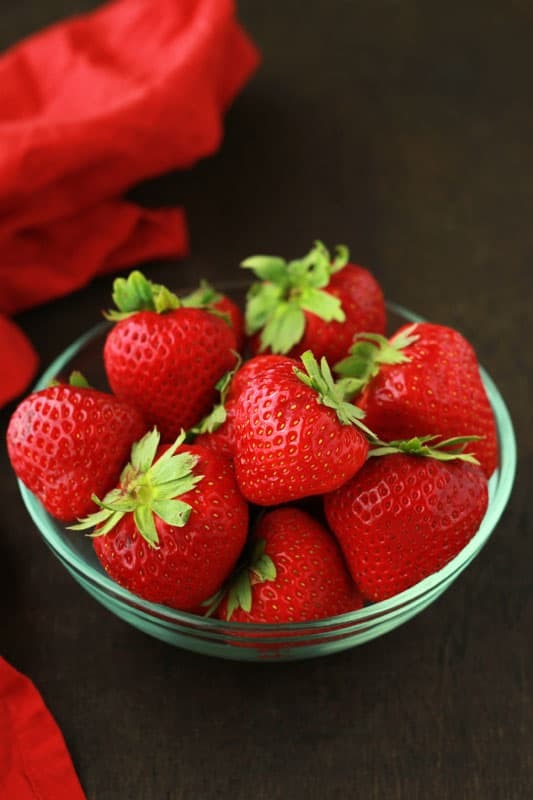 Combine the strawberries with 1/4 cup sugar in a small bowl. Cover and refrigerate until ready. Whisk together the flour, 3 tablespoons of sugar, salt, and baking powder. 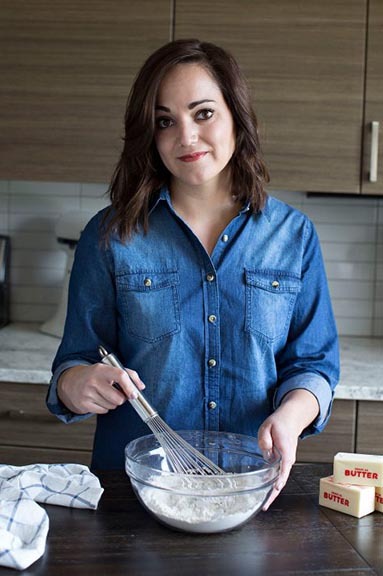 Cut in the butter using a pastry blender or two knives. Stir in the cream until a dough forms. Turn the dough onto a lightly floured surface and knead just until it comes together. Roll until 1/2 inch thick and cut into circles. Bake 10 minutes or until lightly browned. Top with your strawberry mix and whipped cream. Tip: This recipe does better if you mix it by hand. The secret is not to over mix the dough. I love the recipe just for two!!! I’m the same…. I hate having so much food just laying around (because I WILL eat it!) so I usually only make a half or a quarter of a recipe, or if I make a full batch, then I freeze most. These strawberry shortcakes look so delicious!!! I’m a little behind on my comment love friend!!! I’ve been looking at them, but haven’t had a minute to say hello until now! 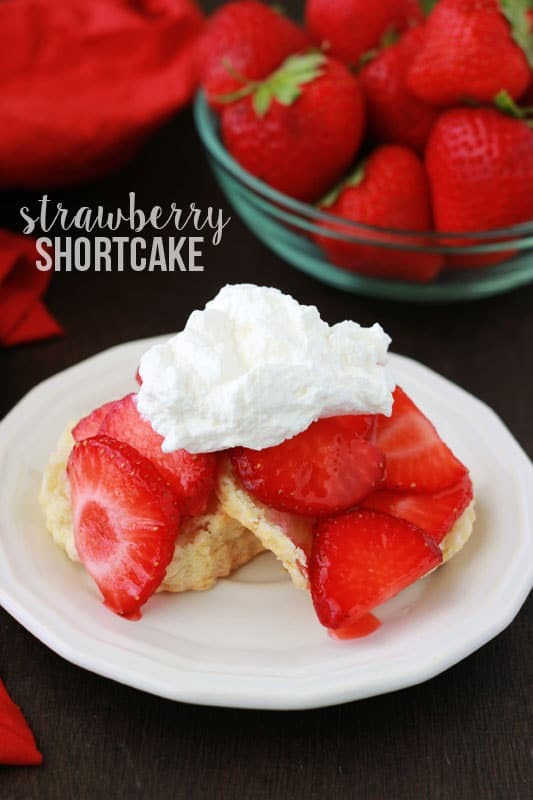 This looks so yummy – I love strawberry shortcake! And I love desserts for two, because I have a problem with wanting to eat the ENTIRE pan!! to say concerning this article, in my view its truly awesome in favor of me.